By pabengos in Meetings / Görüşlər on 9 November, 2017 . Between October 16 and 19, a delegation of 23 people representing the PETRA project partners met at the University of Debrecen (Hungary). The institutions were represented by four assistant rectors, four deans, directors of international offices, directors of institution and department heads. During those days, the members of the international delegation attended professional conferences, conferences and workshops and visited the university’s educational buildings and laboratories. The International Conference, with the participation of the members of the universities that make up the Consortium, was held on Thursday, the 19th. It should be remembered that the program is composed fourteen partners from six different countries. 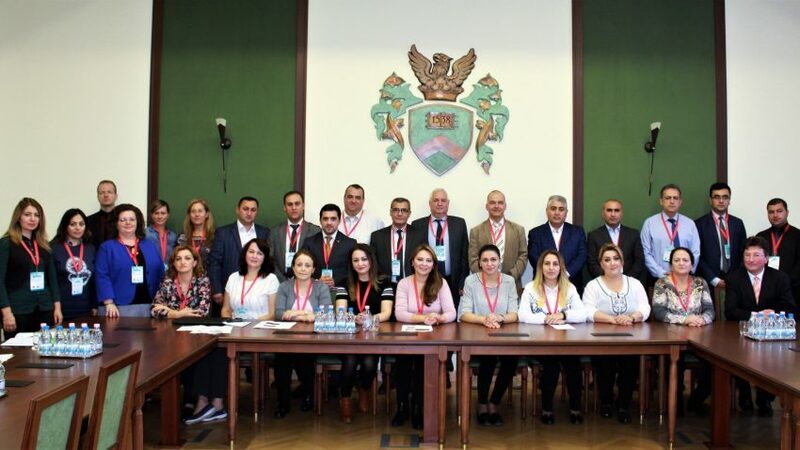 Eight of these partners are universities of Azerbaijan, centerpiece of the project, because the objective is improving Higher Education in that country. Specifically, the topics covered are: learning and teaching methodology, ICT application, quality and effectiveness, and student and teacher mobility programs in Higher Education. The prospects of cooperation between the universities were discussed at the meeting and the sides reached agreement on bilateral cooperation within the frames of the Erasmus + program. 16 və 19 oktyabr tarixlərində PETRA layihəsi tərəfdaşlarını təmsil edən 23 nəfər heyət Debrecen Universitetində (Macarıstan) görüşdü. Müəssisələr dörd köməkçi rektor, dörd dekan, beynəlxalq ofis müdirləri, təşkilat direktorları və şöbə müdirləri tərəfindən təmsil olundu. Həmin günlərdə beynəlxalq nümayəndə heyət üzvləri peşəkar konfranslar, konfranslar və seminarlar keçirmiş, universitetin tədris binaları və laboratoriyalarını ziyarət etmişlər. Konsorsiumu təşkil edən universitetlərin üzvlərinin iştirakı ilə təşkil edilən Beynəlxalq Konfrans, 19-cu cümə günü keçirildi. Qeyd edək ki, proqram altı müxtəlif ölkədən on dörd tərəfdaşdan ibarətdir. Bu tərəfdaşların səkkiz hissəsi həmin ölkədə ali təhsilin inkişafı məqsədi ilə layihənin mərkəzində olan Azərbaycan universitetləridır. Xüsusilə, mövzular: təhsil və tədris metodologiyası, İKT tətbiqi, keyfiyyət və səmərəlilik, ali təhsildə tələbə və müəllim hərəkətliliyi proqramları. Görüşdə universitetlər arasında əməkdaşlığın perspektivləri müzakirə edildi və tərəflər Erasmus + proqramı çərçivəsində ikitərəfli əməkdaşlıq haqqında razılığa gəliblər.